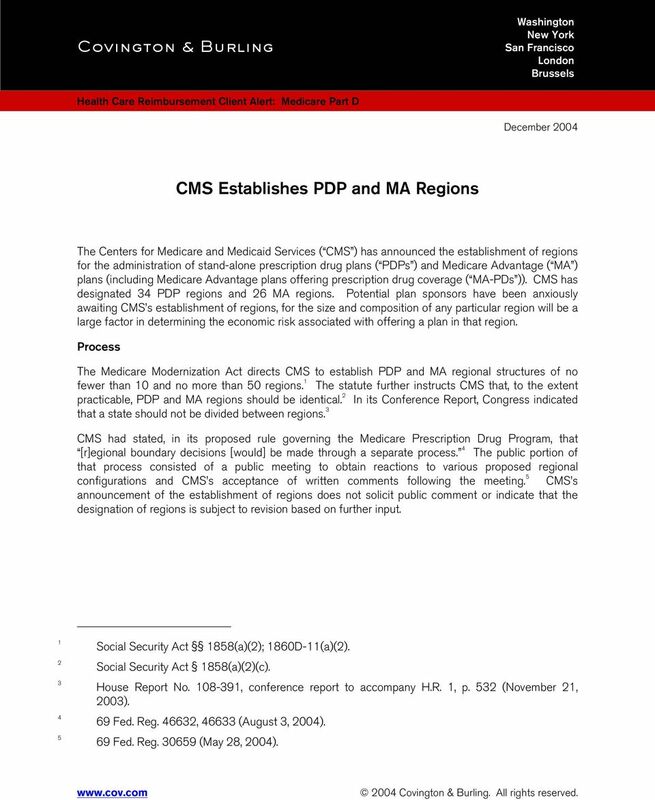 Download "CMS Establishes PDP and MA Regions"
1 Washington New York San Francisco London Brussels Health Care Reimbursement Client Alert: Medicare Part D December 2004 CMS Establishes PDP and MA Regions The Centers for Medicare and Medicaid Services ( CMS ) has announced the establishment of regions for the administration of stand-alone prescription drug plans ( PDPs ) and Medicare Advantage ( MA ) plans (including Medicare Advantage plans offering prescription drug coverage ( MA-PDs )). CMS has designated 34 PDP regions and 26 MA regions. Potential plan sponsors have been anxiously awaiting CMS s establishment of regions, for the size and composition of any particular region will be a large factor in determining the economic risk associated with offering a plan in that region. Process The Medicare Modernization Act directs CMS to establish PDP and MA regional structures of no fewer than 10 and no more than 50 regions. 1 The statute further instructs CMS that, to the extent practicable, PDP and MA regions should be identical. 2 In its Conference Report, Congress indicated that a state should not be divided between regions. 3 CMS had stated, in its proposed rule governing the Medicare Prescription Drug Program, that [r]egional boundary decisions [would] be made through a separate process. 4 The public portion of that process consisted of a public meeting to obtain reactions to various proposed regional configurations and CMS s acceptance of written comments following the meeting. 5 CMS s announcement of the establishment of regions does not solicit public comment or indicate that the designation of regions is subject to revision based on further input Social Security Act 1858(a)(2); 1860D-11(a)(2). Social Security Act 1858(a)(2)(c). House Report No , conference report to accompany H.R. 1, p. 532 (November 21, 2003). 69 Fed. Reg , (August 3, 2004). 69 Fed. Reg (May 28, 2004) Covington & Burling. All rights reserved. 2 PDP Regions 6 Of the 34 PDP regions, 7 25 consist of single states. Six regions consist of two states. 8 Three regions encompass more than two states. 9 MA Regions 10 Of the 26 MA regions, consist of single states. Fourteen of the states that are their own regions for PDP purposes have been combined into seven two-state regions for MA purposes. 12 Two of the PDP two-state regions have been combined into a four-state region. 13 The remaining PDP two-state regions and other multi-state regions remain unchanged for MA purposes. CMS s Stated Principles CMS stated that its key considerations in establishing PDP regions were: Having a population adequate to assure PDP viability but not so large that plans would have difficulty enrolling and providing services, particularly in the start-up year. Making PDP regions fit within MA regions as closely as possible so that the regions are transparent to beneficiaries. 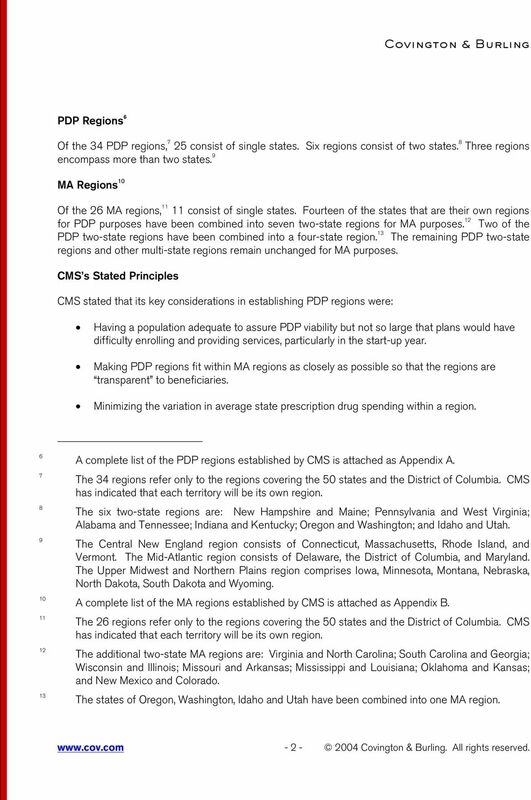 Minimizing the variation in average state prescription drug spending within a region A complete list of the PDP regions established by CMS is attached as Appendix A. The 34 regions refer only to the regions covering the 50 states and the District of Columbia. CMS has indicated that each territory will be its own region. The six two-state regions are: New Hampshire and Maine; Pennsylvania and West Virginia; Alabama and Tennessee; Indiana and Kentucky; Oregon and Washington; and Idaho and Utah. The Central New England region consists of Connecticut, Massachusetts, Rhode Island, and Vermont. The Mid-Atlantic region consists of Delaware, the District of Columbia, and Maryland. The Upper Midwest and Northern Plains region comprises Iowa, Minnesota, Montana, Nebraska, North Dakota, South Dakota and Wyoming. 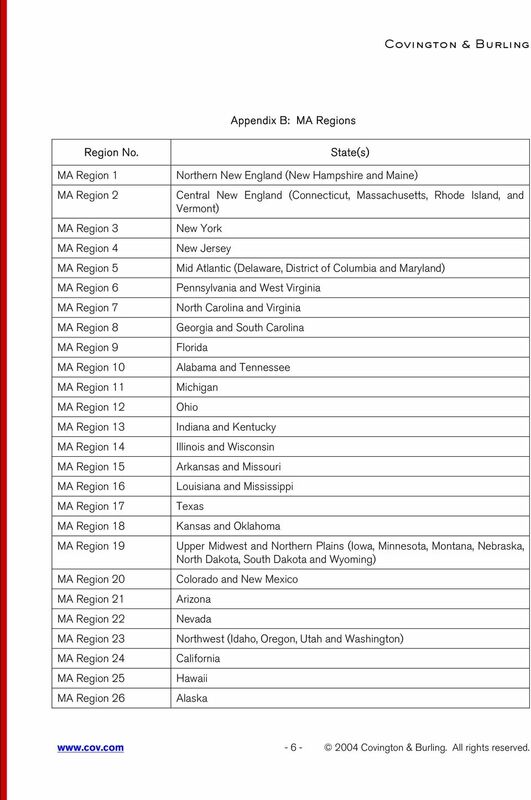 A complete list of the MA regions established by CMS is attached as Appendix B. The 26 regions refer only to the regions covering the 50 states and the District of Columbia. CMS has indicated that each territory will be its own region. The additional two-state MA regions are: Virginia and North Carolina; South Carolina and Georgia; Wisconsin and Illinois; Missouri and Arkansas; Mississippi and Louisiana; Oklahoma and Kansas; and New Mexico and Colorado. The states of Oregon, Washington, Idaho and Utah have been combined into one MA region Covington & Burling. All rights reserved. 3 With respect to MA regions, CMS s stated key considerations were: Having a population adequate to assure plan viability but not so large that plans would have difficulty enrolling and providing services, particularly in the start-up year. Having a sufficient number of existing plans so that an adequate number of potential plan participants could reasonably be assumed. Minimizing the variation in health plan costs within a region. Limiting disruption to Medicare patient flows in areas where patients who live in one state seek care in another. Implications This announcement of PDP and MA regions removes much of the uncertainty around this critical component of implementation of the new law. 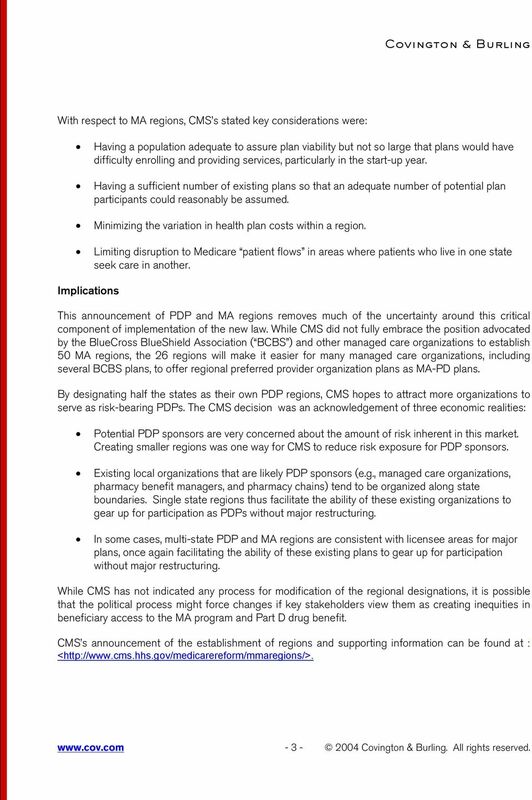 While CMS did not fully embrace the position advocated by the BlueCross BlueShield Association ( BCBS ) and other managed care organizations to establish 50 MA regions, the 26 regions will make it easier for many managed care organizations, including several BCBS plans, to offer regional preferred provider organization plans as MA-PD plans. By designating half the states as their own PDP regions, CMS hopes to attract more organizations to serve as risk-bearing PDPs. The CMS decision was an acknowledgement of three economic realities: Potential PDP sponsors are very concerned about the amount of risk inherent in this market. Creating smaller regions was one way for CMS to reduce risk exposure for PDP sponsors. 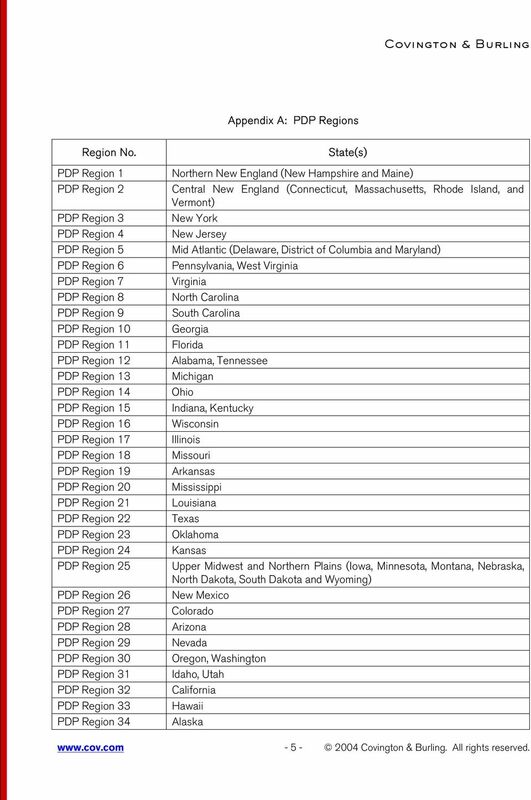 Existing local organizations that are likely PDP sponsors (e.g., managed care organizations, pharmacy benefit managers, and pharmacy chains) tend to be organized along state boundaries. Single state regions thus facilitate the ability of these existing organizations to gear up for participation as PDPs without major restructuring. In some cases, multi-state PDP and MA regions are consistent with licensee areas for major plans, once again facilitating the ability of these existing plans to gear up for participation without major restructuring. While CMS has not indicated any process for modification of the regional designations, it is possible that the political process might force changes if key stakeholders view them as creating inequities in beneficiary access to the MA program and Part D drug benefit. CMS s announcement of the establishment of regions and supporting information can be found at : < Covington & Burling. All rights reserved. 4 This information is not intended as legal advice, which may often turn on specific facts. Readers should seek specific legal advice before acting with regard to the subjects mentioned herein. 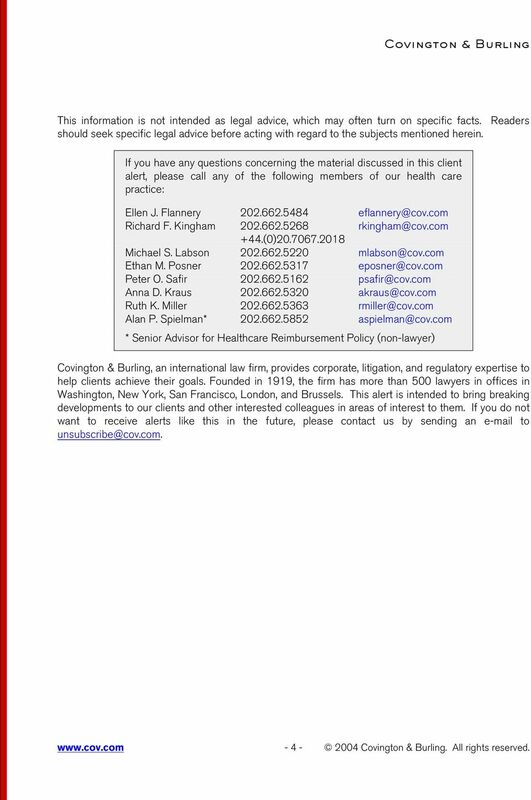 If you have any questions concerning the material discussed in this client alert, please call any of the following members of our health care practice: Ellen J. Flannery Richard F. Kingham (0) Michael S. Labson Ethan M. Posner Peter O. Safir Anna D. Kraus Ruth K. Miller Alan P. Spielman* * Senior Advisor for Healthcare Reimbursement Policy (non-lawyer) Covington & Burling, an international law firm, provides corporate, litigation, and regulatory expertise to help clients achieve their goals. Founded in 1919, the firm has more than 500 lawyers in offices in Washington, New York, San Francisco, London, and Brussels. This alert is intended to bring breaking developments to our clients and other interested colleagues in areas of interest to them. If you do not want to receive alerts like this in the future, please contact us by sending an to Covington & Burling. All rights reserved. 5 Appendix A: PDP Regions Region No. PDP Region 1 PDP Region 2 PDP Region 3 PDP Region 4 PDP Region 5 PDP Region 6 PDP Region 7 PDP Region 8 PDP Region 9 PDP Region 10 PDP Region 11 PDP Region 12 PDP Region 13 PDP Region 14 PDP Region 15 PDP Region 16 PDP Region 17 PDP Region 18 PDP Region 19 PDP Region 20 PDP Region 21 PDP Region 22 PDP Region 23 PDP Region 24 PDP Region 25 PDP Region 26 PDP Region 27 PDP Region 28 PDP Region 29 PDP Region 30 PDP Region 31 PDP Region 32 PDP Region 33 PDP Region 34 State(s) Northern New England (New Hampshire and Maine) Central New England (Connecticut, Massachusetts, Rhode Island, and Vermont) New York New Jersey Mid Atlantic (Delaware, District of Columbia and Maryland) Pennsylvania, West Virginia Virginia North Carolina South Carolina Georgia Florida Alabama, Tennessee Michigan Ohio Indiana, Kentucky Wisconsin Illinois Missouri Arkansas Mississippi Louisiana Texas Oklahoma Kansas Upper Midwest and Northern Plains (Iowa, Minnesota, Montana, Nebraska, North Dakota, South Dakota and Wyoming) New Mexico Colorado Arizona Nevada Oregon, Washington Idaho, Utah California Hawaii Alaska Covington & Burling. All rights reserved. 6 Appendix B: MA Regions Region No. MA Region 1 MA Region 2 MA Region 3 MA Region 4 MA Region 5 MA Region 6 MA Region 7 MA Region 8 MA Region 9 MA Region 10 MA Region 11 MA Region 12 MA Region 13 MA Region 14 MA Region 15 MA Region 16 MA Region 17 MA Region 18 MA Region 19 MA Region 20 MA Region 21 MA Region 22 MA Region 23 MA Region 24 MA Region 25 MA Region 26 State(s) Northern New England (New Hampshire and Maine) Central New England (Connecticut, Massachusetts, Rhode Island, and Vermont) New York New Jersey Mid Atlantic (Delaware, District of Columbia and Maryland) Pennsylvania and West Virginia North Carolina and Virginia Georgia and South Carolina Florida Alabama and Tennessee Michigan Ohio Indiana and Kentucky Illinois and Wisconsin Arkansas and Missouri Louisiana and Mississippi Texas Kansas and Oklahoma Upper Midwest and Northern Plains (Iowa, Minnesota, Montana, Nebraska, North Dakota, South Dakota and Wyoming) Colorado and New Mexico Arizona Nevada Northwest (Idaho, Oregon, Utah and Washington) California Hawaii Alaska Covington & Burling. All rights reserved.